– Analysis: In the picture, we can see that maybe a secretary is reporting about the earthquake to the presedent. The report said that earthquake was caused by unamed fault. 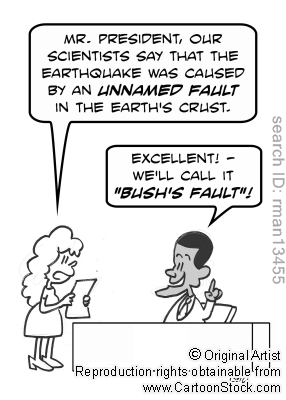 After listening to the report, the presedent immediately decided to call the unamed fault “BUSH’S FAULT”. The president blamed for the fault on Bush president who was a former president. 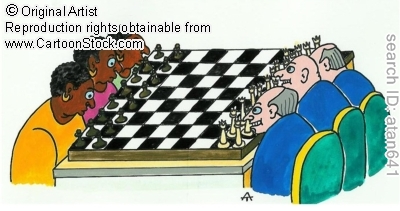 – Analysis: In the picture, there are six people playing chess. Three black persons are in the same team and three white persons are in the same team. It is easy to see the racial discramination because black persons only have pawns which is the lowest position in the chessboard in their hands while white persons hold all power chesspieces such as king, queen and net force. 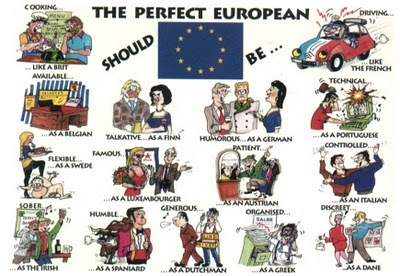 – Analysis: This cartoon shows stereotype of Europe countries’ qualities. Clue- search for the opposite adjective e.g-for British: bad at cooking; French:bad- tempered while driving. After reading your three items, I really like the second items. it states out the discrimination clearly, however, what i am impressed is the discrimination which is showed by the chesspieces’ position. i like all your items, especially the third item that is the same as one of my items. it very interesting. also, these items have cear bias so views are easy to understand. however, it is better for you to pay attention to some bit of mistakes of spelling and word form such as “persons” in the second item. besides, in the third item, i supose that the word “stereotype in the part of analysis may be replaced by these common and familiar images….. anyway, i enjoy your items so much.